Inspired by the effortless style of French women, these earrings possess an air of quotidien that so many emulate but very few accomplish. Echoing the power of the mighty obelisk, precision is the defining characteristic of the Obelisco Collection – perfect for a woman of confident elegance. 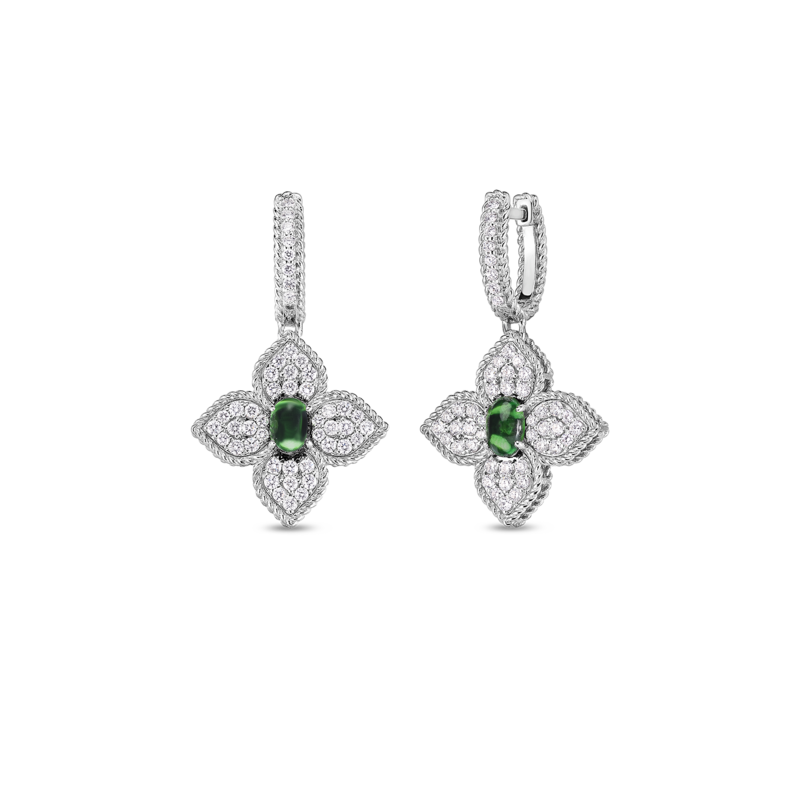 A symbol of perfection, the number 3 gives shape to each of the pieces in the Petals Collection. Essential and modern, the design is also delicate, just like the nature it represents. The view from the sea of this tiered panorama inspired the design of the collection. Ethereal and essential, it is perfectly suited to contemporary trends. The brilliance of the diamonds lights up the jewels, evoking the lively, refined atmosphere that has always characterized Portofino. It’s a timeless icon of la dolce vita and the inspiration behind masterpieces in art, fashion, and film. This collection is a reinterpretation of the brand's historical Barocco line. In this version, attention to detail and precise manufacturing culminate to reveal a twisted gold thread technique. White diamonds, symbolic details of light, accent the harmonious and voluminous design, creating a new edition of the marquise line. Diamonds have been used to illuminate and embellish the design, yet ultra-glossy gold is the fundamental component of the collection. Torchon has an essential feel; a modern reinterpretation of a classic design, but each piece is the result of research, dedication and extreme perfection. Inspired by the sinuous flow of postmodern architecture, this collection represents the material shape of the most romantic side of a woman’s imagination. Designed as an ode to the harmonious melodies of music, the woman who wears Symphony stacks bangles and layers necklaces according to her style and her mood. The timeless combination of black and white diamonds elevate this collection to something irresistibly elegant, with an intriguing edge. Impressive design alludes to impactful style with the collection’s sleek, asymmetrical silhouettes and piercing green chalcedony accents. Diamonds by the Inch, with delicate chains and bezel set stones exude femininity— but layered they create a fresh look. Hand etched and carved, the beautifully textured pieces are bold yet delicate. The intricate details lend a classic feel to contemporary designs. The only brand to own the name “perfect diamond hoop,” these round brilliant diamonds embellish both the outside and inside of each hoop creating absolute symmetry. Just as its circular shape suggests, The Perfect Hoop is a classic gift, offering continuous beauty both from the inside and out. Leaping off the pages of a fairytale, hand-crafted satin finish pieces showcase romantic floral patterns and contemporary expressions. Within each design lies a strong, fascinating structure beckoning that of the iconic bridge in San Francisco. Revolutionary in design, hand-finished hollow links bring a bright lightness to an otherwise bold look. As its name suggests, rich chain link bracelets and rings harken the vibrant style of the 1970s. Tiny Treasures is a collection of whimsical 18K gold and diamond pendants. There is a piece for every personality. Intricately designed for the modern man, cufflinks offer discerning style edge with a stroke of luxury. Discover a hand-picked selection of pieces to celebrate her sparkle. 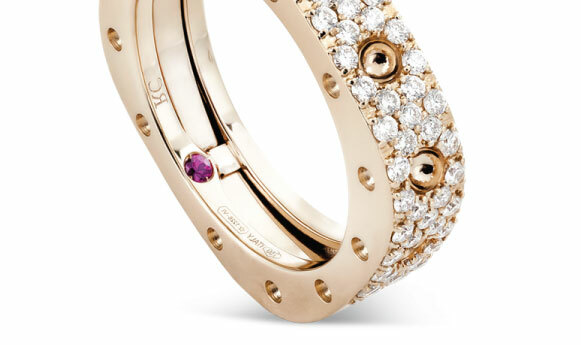 Roberto Coin signs each one of his pieces with a small ruby casted inside the jewel, in direct contact with the skin of who wears it. This magical signature, surrounded by an antique halo of legend, represents the message of good wishes that Roberto Coin dedicates to his passionate clientele. There are no recently viewed products to display. Sign up to our newsletter to receive updates on the art of Coin. Don't hesitate in contacting us for any questions you might have. © 2019 Roberto Coin S.p.a. In order to properly view the new roberto coin website please update your browser with one of the options listed belkow. Log in to your account to track the status of your orders and more. looks like really loves this piece and we thought you’d want to know.